Suspended from the ceiling, a glittering mobile may surprise visitors to the Department of Clinical Neurosciences and Dermatology (Neuclid) at the Hopitaux Universitaires de Geneve (HUG). Its shapes echo those of an optical ambiguity – the Rubin vase – which appears in the void resulting from the confrontation of two identical profiles – and is often used by neurologists. 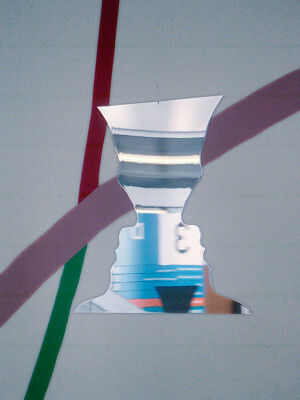 The mobile, called “Neuclid Team Spirit” is part of an installation that marks the end of Hervé Graumann’s stay at the Hospital as the artist-in-residence and the seven different profiles are those of the various heads of department – as well as of one younger physician. 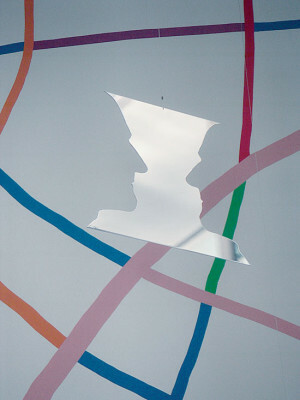 In “Dialogues 2”, Hervé Graumann spent several months exploring the Neuclid department: accompanying Professor de Tribolet into the operating theatre during surgical interventions on the brain; examining optical illusions in Professor Safran’s neuro-ophthalmology department; to concentrate finally on the work of Professor Landis’s neurology department. Here, Graumann followed Doctor Perrig in his everyday activities in the “Epileptology Unit” and also participated as a guinea pig in a series of neurological tests such as multichannel electroencephalography and functional magnetic resonance. The artist was therefore not just an observer but had subjected himself to the medical gaze – an experience shared with the patients in the department. “Neuclid team spirit” ironically subverts the hierarchy of the medical gaze inverting the relation between observer and observed. Having photographed each one of the doctors, Graumann “operated” on them by perfecting every profile on computer before they were cut in brass sheet and chromium plated. As each physician stares at his mirror image and, at the same time, is refracted by those of his colleagues, Graumann playfully questions the nature of the Neuclid “team spirit”. How do these individuals relate to each other – and to the collective? And further – to the patients and to the public beyond? Patients and medical staff can now scrutinise the profiles of the medical authorities, balanced, a little precariously – immaterial presences – in the adjacent space, a contemporary version of the celebratory medical bust. The relation between individual and collective is a theme in Graumann’s second work. During his residency, the artist had the opportunity to explore the complex underground labyrinth that links the Centre Mėdical Universitaire to the Hospital. Regularly visiting the hospital shop and the hospital chemist located in this basement area, Graumann began to collect an array of objects ranging from the medical to the domestic- all defined as obsolete and destined to be thrown away. These objects were later assembled into two works entitled “Indefinable patterns”: a floor piece at the Musée d’art moderne et contemporain (Mamco) and a smaller installation inside a glass table, recalling the idea of the cabinet of curiosities, at the hospital. By associating ordinary household goods with medical implements the artist demystifies the latter of some of their aura. The value assigned to these objects is generated by the viewer’s perception of their relationships. Mimicking the function of a neurological test, Graumann questions the nature of these affinities and of human perception. Each individual object is recognizable, but, as a whole, the relationships between the objects remain ever changing and indefinable. 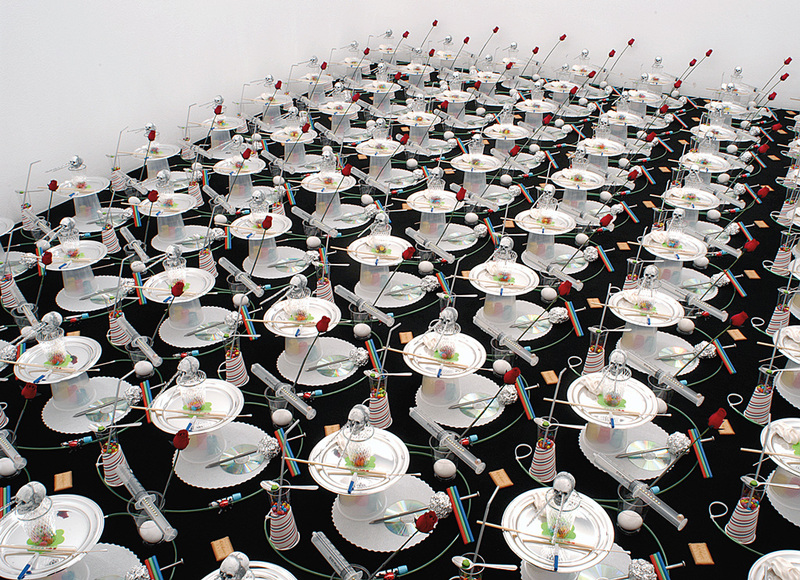 Pattern – Vanité 2b, 2003 – installation, objets divers / installation, sundry objects – 400 x 500 cm.